NEW CASTLES FOR 2018,CLICK ON THE LEFT SIDE TO SEE OUR 2018 NEW CASTLES. 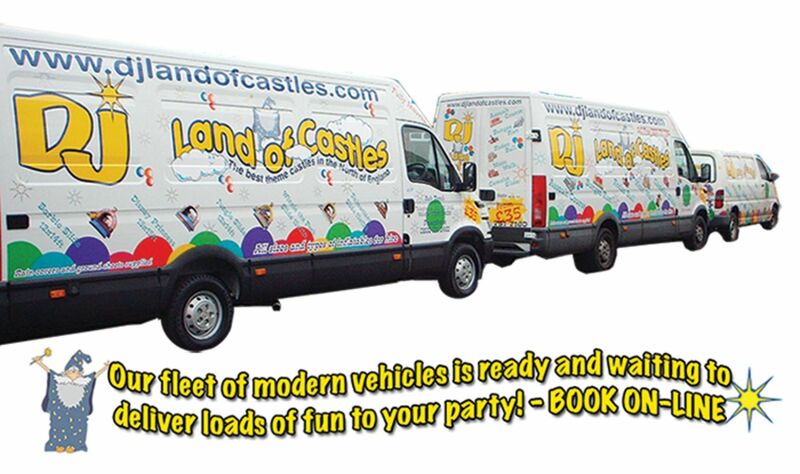 DJ land of castles is a leading supplier of bouncy castles inflatables for hire based in Liverpool and Merseyside area. We also hire to the surrounding areas of Liverpool which include Runcorn, Warrington, Widnes, Wirral and St Helens. We are a family run bouncy castle hire company and have been for the past 18 years. We stock different sizes of themed bouncy castles,bouncy castles slides,adult bouncy castles,inflatable slides,plus are assault courses,and dome castles.Also are rodeo bull hire is suitable for children and adults.The rodeo bull we have has a SOFT FOAM SAFETY HEAD, and is controlled by our trained staff for your safety.We are able to adjust the ride to suit all age groups.If your date or time is not available when you book are rodeo bull online,please give us a call,As the bull can be booked out more than once on the same day,As long as your time you want is still available for you. Our bouncy castle hire firm is the biggest in the north of England with an excellent reputation; with our modern fleet of vehicle's to bring lots of fun to your partyYou can be sure that we will never let you down!.We also have the Best range of themed bouncy castles in the north west. So don't delay and book your castle today and let the fun start.Are you planning on hosting an event but worried about electricity and loose wires hanging around? Maybe your organising a summer fete, a street party or even a pub fun day. We have available some of the most reliable and powerful generators for hire. Our generators are only available to hire along with our inflatables and may not be hired on there own.Go on the generators page on the left hand side on are home page to get the prices of the grnerators you need or give us a call. Our payments methods are: Cash (On delivery), Cheque (10 days in advance - contact us for details. All our children's bouncy castles are suitable for indoor and outdoor events. (providing the necessary space is available). .If you are wishing to check the availability of our bouncy castles,inflatable slides,and our rodeo bull hire,plus are assault courses,and domes castles,have a look at the "Check Availability" Application on the left hand side of this home page.It will make searching our website easier and help you choose which bouncy castles are in on the day of your party. Delivery and collection;Drop off between 7am & 12pm,Pick up times from 6pm onwards-Supervisors are available at £15 per hour-Call for details.And we will supervisor your event for you,so you can enjoy your party as well. If you require a specific drop off or pick up time for your bouncy inflatable castle please call to arrange a time that suits you.If you would wish you keep your bouncy inflatable castle over night that can also be arranged at an extra charge, depending on the bouncy inflatable castles hired.Check are website for the overnight charges,it tells you on each castle what the charge is.If you have any of are bouncy castles or mega slides out overnight they get pick up any time between 7/12am the next morning as they my be booked out on that day. Our bouncy castles and the rodeo bull are available for hire to anyone in Liverpool,the Wirral, Runcorn, St Helens, Widnes or Warrington. We cover a 10 mile radius from Liverpool Airport without any delivery charge and have a small fee for those outside that range.Use our post code checker on the left hand side for a quote.Hire your bouncy castle from one of the leading bouncy castle hire Liverpool companies today!.Our themed bouncy castles,rodeo bull hire,and our mega inflatable slides and are adult bouncy castles,assault courses,dome castles, are available to hire 7 days a week 365 days a year. There are also discounts when the winter months come in so you can still hire our bouncy castles even when it comes to Christmas period. We cater for all events and occasions that includes, Parties, Schools, Clubs, Birthdays, BBQ’S, Weddings, Christenings, Fundays, Sponsored Bounce, Fetes, Social Events, Play Schemes, Youth Groups, Scouts, Brownies, Groups, Company Celebration Days, Corporate and lots more events too.Our fleet of modern vehicles is ready and waiting to deliver lots of fun to your party! so don't delay and book your castle today. ALL OUR INFLATABLE BOUNCY CASTLES MUST BE SUPERVISED AT ALL TIMES BY A RESPONSIBLE ADULT OVER THE AGE OF 18,If it start raining or the wind picks up you must turn the inflatable castles off and leave it off till the weather conditions improve,these are part of the terms and conditions,from Dj Land of Castles Ltd you agreed to abide to all the time,while the inflatable castles are on hire to you.